Reunion time! 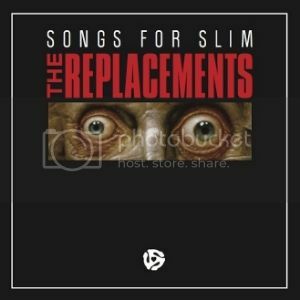 Granted, this EP and three subsequent festival gigs featuring Paul, Tommy, and a couple of random sidemen as “the Replacements” constitutes only second most exciting reunion of 2013 after the TOTALLY AWESOME ‘NSync reunion that happened at the VMAs, but still. Besides, this wasn’t your usual mid-life crisis cash grab deal. Rather, its impetus was Slim Dunlap—best known for playing lead guitar on those last two Mats LPs that nobody gives a crap about—suffering from a sudden a debilitating stroke. Naturally, this caused he and his family to incur gargantuan medical bills (THANKS FOR NOTHING, OBAMA, YOU SOCIALIST KENYAN NAZI), spurring his former bandmates to organize a charitable recording project to help their old buddy make ends meet. That project involved not just this EP, but also a full tribute album featuring a bunch of famous Slim/Mats fans covering songs from Slim’s solo catalog, which, unbeknownst to me, has something of cult following. The three songs not written by Slim Dunlap are a pleasingly eclectic and recognizable. They do up Gordon Lightfoot’s mid-60s folk hit “I’m Not Sayin’” to sound just like a vintage mid-80s Westerberg composition; they rip through Hank Williams’ classic “Lost Highway” in a rowdy barroom-friendly manner that suggests if the band had never broken up, they could have carved out a place for themselves during the 90s alt-country boom; and they close with a tongue-in-cheek, “Lovelines”-esque take on the show tune “Everything’s Coming Up Roses,” which I have actually seen performed live on Broadway by Bernadette Peters! I’m incredibly cultured, I know, but I still love dat rock ‘n roll. And those Mats. Glad they’re back. © 2013 Jeremy Etc. All images are copyrighted by their respective authors.